Abbas Kiarostami, one of the most celebrated figures in contemporary film, died in Paris on Monday. The Iranian director and artist—whose unconventional and wide-ranging body of work made pointed use of ambiguity, sometimes blurring the line between reality and fiction—had been undergoing treatment for gastrointestinal cancer. He was 76. 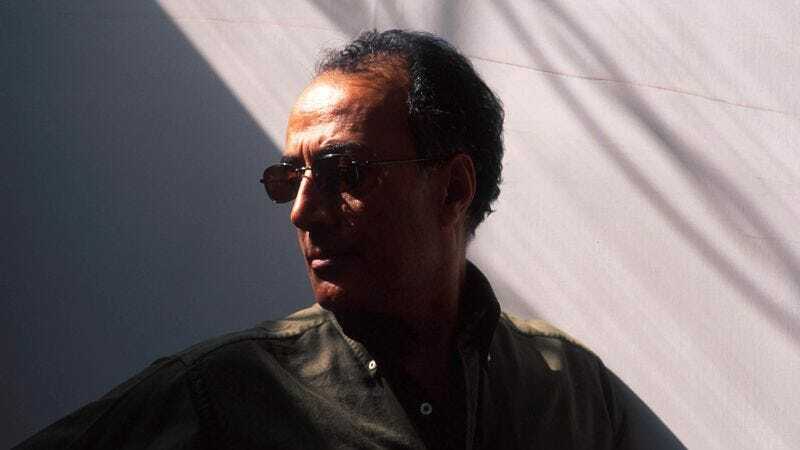 Like Satyajit Ray, to whom he was often compared during his first years of international recognition, Kiarostami was trained as a graphic artist. While studying at the University Of Tehran School Of Fine Arts, he supporting himself by working part-time as a traffic officer. After graduation, he designed posters and children’s books, before moving on to film title sequences and commercials, directing over 150 TV ads in the space of just a few years. He made his first short film, Bread And The Alley, in 1970. Most of Kiarostami’s early works were aimed at children, produced through a film production unit he helped create at Kanun, a youth education organization created in the mid-1960s. He would remain completely unknown outside of his home country until his second fiction feature, Where Is The Friend’s Home?, premiered at the Locarno Film Festival in 1987. The seemingly simple story of an 8-year-old boy trying to return a notebook to a schoolmate from a neighboring village, the movie is often cited as one of the essential films made for children. It was in the 1990s that Kiarostami ascended to the global stage, beginning with his first film of the decade, Close-Up, a groundbreaking study of a real-life incident in which a man conned a family into believing that he was Iranian director Mohsen Makhmalbaf. Sometimes cited as the point where Kiarostami broke with the neo-realist influences of his early work, it inaugurated an extremely productive period during which the director created a string of masterpieces and near-masterpieces—including the Palme D’Or Taste Of Cherry, about a man trying to talk strangers into burying him after he commits suicide—while mentoring and collaborating with younger filmmakers, most notably his former assistant Jafar Panahi. Often employing a minimalist style and unorthodox dramatic spaces—including cars, an obsession that seemed to go back to his days directing traffic, and, in the case of 2008’s Shirin, a movie audience— Kiarostami’s films explored complex themes of identity, responsibility, performance, and spectatorship, raising questions instead of providing easy answers. He worked extensively with digital video in the 2000s, producing several experimental and collaborative projects before returning to more “conventional” fiction features with his final two films, both made outside of Iran: Certified Copy, which was shot in French and English in Italy, and Like Someone In Love, which was made in Japan. The most important and internationally recognized artist to come out of Iran after the Islamic Revolution, Kiarostami had a tremendous impact on film, effortlessly bridging the philosophical and the mundane. In addition to directing features and countless shorts, he was also an accomplished photographer and poet, and dabbled in countless other art forms. A cosmopolitan figure never seen without his trademark dark glasses—which he wore because of an extreme sensitivity to light—Kiarostami often claimed to be neither especially political nor “politically religious,” though he openly criticized Iran’s leadership in interviews. Going back to his early days with Kanun, Kiarostami maintained a strong link with youth arts education, and hosted regular workshops for young filmmakers in Tehran and abroad throughout his career. He is survived by two sons.